I would like to start this month’s article by thanking Bethlehem Grange and Mountain Laurel Pomona for a fine reception that was held for Sharon and me at the Community Hall in Bethlehem, on Dec. 9. It was a great turn out of Grange family and my family for an afternoon of good food and friendship. I also received cards and emails from Grangers who couldn’t make it that day which was well appreciated. This turned out to be a wonderful day for Sharon and me. Thanks once again for putting on such a nice reception. 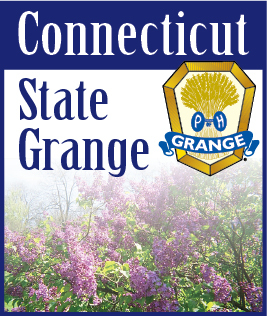 I met with the Legislative Committee in December to work on the Connecticut State Grange Legislative Policy Guide for 2019 that will be passed out to our representatives in Hartford. Gordon Gibson will be our liaison again this year. Gordon does a great job in representing the Grange on legislative issues. On the three withdrawn resolutions from Connecticut – the committee chairpersons came to me and said they were going to reject the resolutions. I withdrew those but the Granges can go back and review them. On the sale of Grange property, I managed to get the resolution back on the floor for discussion. Most delegates agreed that $1,000 was too low but they also thought that 10% of the sale was too high. After much discussion the resolution was rejected. As I am writing this article, I was notified by National Grange that the 2018 Farm Bill passed in the House and the Senate. It is an $867 billion Farm Bill that is now headed for the President’s desk for his signature. In 2019, the General Deputy and Pomona Deputy will begin to schedule inspections for the three Pomona Granges. They would like to schedule the inspections for late spring or early summer. A special meeting can be set up for a degree inspection. For the Subordinate/Community Granges, a questionnaire will be sent out to all Granges to fill out and return to the State Master along with your Executive Committee report and the Steward’s Inventory Report. I am looking to get these out sometime in February or early March. You should be working on your Executive Committee reports in the center of last year’s Blue Book. I know some of the Granges have filled them out and have sent a copy to the General Deputy. Just a quick update on the Northeast Leaders’ Conference, which will be hosted by the Connecticut State Grange on March 29 and 30, 2019. Registration will be from 5 to 7 P.M. on March 29 at the Holiday Inn, Norwich (Where we meet for State Session). We will have speakers lined up for this conference. Todd is working on meal prices and a banquet price. So, keep these dates open. We would like to have a representative from each Grange in Connecticut to attend.